Neither strong nor stable: How the UK’s decline is on show in #GE17. David Jamieson surveys the General Election terrain and examines the deepening UK crisis and the prospects for Corbynism and Scottish independence. The characteristic feature of this General Election is the crisis and decline of the British state and its constituent institutions. People often misunderstand crisis, because they assume it will manifest itself in signs of weakness rather than strength. 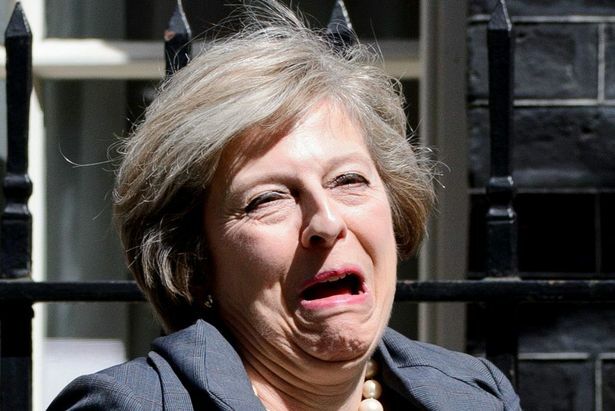 How can the British state be in a crisis, when it’s reactionary and nationalistic tendencies are in the ascendant in the form of Theresa May and her popular-nationalist conservative party? How can the Labour party be in decline if its rallies are being attended by thousands, its pro-Corbyn membership remains at historic highs, and it has produced its most vital and politically ambitious manifesto in decades? How can British democracy be in decline when we face so many elections, an unprecedented seven in the past three years by the time of the General Election vote on 8 June? This article will readdress the analysis of the pro-independence radical left in the light of unprecedented events, and argue it has largely been confirmed by those events. It will argue that national-constitutional and class questions remain powerfully linked as the UK reaches a new phase in its decline. The UK’s current state of decline has its roots in the attempt of UK state managers and political and industrial leaderships to deal with a tumultuous century, which has seen the UK slip from its position as a world-beating global hegemon at the start of the century, to a second rate power, minus its once substantial empire, by the century’s close. In the course of that century of retreat, the UK saw significant changes to its economy and society. These were conditioned by, and mirrored, changes in the world system. But the elite class who control British society, and for whom the state interests are their interests, also had to adapt society to respond the UK’s particular circumstances. The UK’s troubles were present at the start of the century, with pressure from European competitor powers, including Germany, France, Italy and Russia, eroding its imperial hegemony in the underdeveloped world. Its position as a global exporter faced competition and an investment crisis native to capitalist development, including the ability of its competitors to adopt its industrial innovations without having engaged in previous rounds of investment. Fuelled by attacks on pay and conditions, class disputes peaked before the first world war with the great unrest, and resumed immediately afterwards in an atmosphere of global revolution. Though the UK’s internal unrest subsided after the defeat of the 1926 General Strike, the war had already exposed the weaknesses of the British Empire. It would be the Second World War that would knock the UK off the top of the global heap, as the US grew its unprecedented global hegemony amid the global wreckage. The UK’s travails were far from over. It would spend the second half of the twentieth century adapting itself of being a key European ally of the new superpower, and growing its financial sector at the expense of its declining extractive and manufacturing industry. These adaptations were made not only in the context of the new US led global order, but in the teeth of opposition from the working class, who had built up substantial organisational strength through trade unions and political parties – including the Labour party, where working class interests vied for influence with a mainly middle class leadership seeking state governance for the purpose of reforming the harshest aspects of capitalism. The re-organisation of British capitalism followed an intense period of class struggle which saw legal rule breached by trade union strength and the defeat of early Tory attempts to curb working class power in the 1970s. Margaret Thatcher used all the resources of state power to smash the labour movement (as well arrive at a military standstill with the republican movement in Northern Ireland – another pressure on the declining state). But her economic programme deepened rather than alleviated the UK’s economic problems. The economy became increasingly regionally uneven, as industrial and post-industrial areas suffered. This regionalisation and the destruction of the trade union movement had unintended consequences (as tactics adopted to deal with national crises so often do). The organisational and economic structures which had once bounded the working class together in a common identity were falling away. Compare the UK working class of the 1926 General Strike to that of the 1990s. The 1926 General Strike was based on the so called ‘triple alliance’ of coal, steel and rail workers. Organised working class politics followed the physical contours of production, with coal being necessary for steel production, and the rails being essential to the transportation of both the resources used to make steel and the steel product itself. It was a network of people and union organisation spanning the whole of Britain. By the 1990s the coal mines were gone and the steel industry decimated. The railways had been privatised, but in any case were no-longer used in the same freight function on anything like the same scale. With signature industries and industrial and political organisation gone or massively reduced in scale, working class identity changed and a consciousness of working class interests partially abated. With it, a substantial part of the UK’s popular national consciousness went as well. But class discontent had not simply gone away. From the turn of the century on, movements of street protest exploded. This was a global phenomenon, and followed similar neo-liberal re-structuring of many advanced economies around the world. The UK saw the largest demonstrations in its history. They included the monster demonstrations against the Iraq war, trade union mobilisations which belied their own historic industrial weakness, and a student movement far larger and more violent than the UK’s showing in 1968. Though single issues were important in all these mass movements, they were mobilisations of leftwing sentiment, drawing together people with a more or less coherent world view in opposition to the ruling class and their entire programme of re-organisation. This was the character of the Scottish independence movement in 2013-14. The same discontent existed in Scotland as in the rest of the UK. But Scotland’s status as a small, post-industrial nation within the larger transnational UK bloc provided an effective frame and focus for a movement. History has moved quickly since 2014. It is easily forgotten that the independence movement’s rejection of austerity and neo-liberalism was lampooned by mainstream political forces as sign of its detachment from reality. Today neo-liberalism is suffering a crisis of confidence. It is questioned by movements and parties of the left and right around the world. The popularity of doctrines supporting unfettered free trade have peaked and now face the complication of the re-emergence of national economic policies (it is perhaps too early to say how true this is in the world system’s US heartlands, where President Trump offers at least rhetorical rejection). In the UK, Theresa May is learning lessons from the new national-conservative right, and pitching herself as someone who places British and working class identity before political expediency. In the EU referendum, a faction of the right showed its willingness to break the rules, defy the global market and place a political programme before an economic one. But a far more genuine and intellectually coherent break from the status quo has come from the left. Labour’s leaked manifesto represents a break with decades of orthodoxy, pledging £250bn borrowing for infrastructure investment, the only house building programme to be announced on these islands that comes close to tackling the runaway financialised housing market, and plans for public control of parts of the energy and transport systems – mostly natural monopolies where the market has extinguished competition. This rejection of neo-liberal mantra is far more representative of the ideas of the independence movement than the policies of its leading political party, the SNP. The only full data set of 2014 Yes activists so far, conducted by researchers at Herriot Watt University and Common Weal, places them ideologically to the left of not only the SNP, but also to the left of the Scottish Greens. This shouldn’t be a surprise. The Yes movement and Corbyn supporters are basically the same people – the working class (broadly conceived as those whose only productive asset is Labour, rather than narrowly as a 70s sitcom character), trained in anti-war and anti-neoliberal politics by decades of mass mobilisation and bearing the scars of capitalist re-organisation. The Yes movement helped to impregnate the UK with the global populist mood, by destabilising British politics, by being one (limited) factor among several triggering the Corbyn leadership phenomenon, and by stoking, unconsciously and inadvertently, a rightwing English nationalism. Constitutional-national politics are not a trivial diversion from class politics. They are class politics by another means. This was true not only when populist leftwing Scots seized on the Scottish national question as a vehicle for their own discontent in 2014, but also when a small faction of the British ruling class, mobilising a section of discontented workers and middle class, proposed and won Brexit. As Neil Davidson has examined in detail on this website, Brexit is the strategy of a minority of the ruling class exasperated by the persistence of the crisis, and the state’s inability to solve it over many decades. This group idolises the open class war and liberal economic doctrine of the Thatcher era, and psychologically links market discipline with heightened national sovereignty and British national feeling. Brexit is unlikely to be the all-out disaster predicted by the majority faction of the ruling class before the July 2016 referendum. But it is a relative diminution of the UK’s global standing, and will only add to the crisis. It must be remembered that the wealthy and powerful, though they seek to act rationally to protect the interests of the British state, and their own interests bound up with it, can only do so through the prism of ideological understandings of the world. These understandings are based on unfounded assumptions about the fundamental correctness of the order they have created, and complicated and obscured by competition between factions of capital itself. Corbyn’s attempts to elide the constitutional and national crises facing the UK (Scotland, the EU, Northern Ireland, England), is the product of several tributaries. It represents the limitations of Labourism, a project tied to the British state, and one which, because it seeks to defend and advance the interests of the working class through that state, is one essentially reactive to the constitutional pressures, rather than visionary in its attempts to radically transform it (the radical federalism advanced by groups like the Red Paper collective and adopted by Corbyn are worth the hearing in their own terms, but they remain very much an afterthought – the two standout constitutional measures in the Labour manifesto are commitments to oppose Scottish independence, and acceptance of the current broad terrain of the Brexit debate, though sans the governments white paper). But to be fair to Corbyn, he also faces pressures from the right of the party to take even more conservative position on constitutional matters. It also represents the persistent bad advice of Scottish Labour cohorts, whose ideological relationship to the national question is deeply related to their parliamentary competition with the SNP. A superior approach to constitutional politics was on display in the recent first round of the French elections, when Jean-Luc Mélenchon and his La France insoumise movement proposed a radical democratisation of the French state under the banner of the creation of a ‘Sixth Republic’, leading a debate on bold constitutional positions that more moderate political forces couldn’t keep up with. Addressing the profound democratic deficit across the UK, which will only grow worse as a deeply unrepresentative Conservative party increases its dominance and disenfranchises workers with constituency boundary changes, new anti-union rules and diminutions of the influence of devolved assemblies, will remain relevant. The left must address what political scientists call the ‘regime’ level of the political system, rather than merely the governmental. Where next for the crisis? But as important as these constitutional battles are, their social content remains vital. Corbyn’s bold policies, his programme to halt the collapse in living standards and to involve further entanglement in the US led world order, are the politics of the independence movement, and we should hold them up as a foil to the timid centrism of the SNP. The housing schemes didn’t propel the Yes vote to 45 per cent because they were dead keen on the EU. Failure to speak to the leftwing and populist instincts of the independence core support will confuse and demoralise. And it will embolden the right, re-organising around the Tories. Not long after the independence referendum in 2014, myself and Jonathon Shafi wrote on this site that Scottish Labour’s crisis was ‘organic’ rather than ‘conjunctural’, that the crisis was innate to the organisation and its nature. In the Scottish context, that analysis has been confirmed by its continued loss of support. But the crisis in the UK party is also profound. Labourism, as a distinctive political tradition, is coming to an end. Corbynism represents a reconsolidation of the deflected workers’ movement described earlier, and it is incompatible with the Labour right. This is the importance of Corbynism for future developments in the declining UK. If Corbyn’s factionalised Labour cannot form a government, it can supply the basis for a future radical left movement. This is one of the reasons why Liam Young’s call for there to be greater interplay between the movements is important. Whatever position people take on the 2017 General Election, these forces rely on each other for mutual success. But Scottish independence, nor a Corbyn government, would halt the crisis which is endemic both to the UK and to the wider world system. It is not the role of the left to arrest the decline of the UK, only to intervene in that decline to expand the fighting capacity of the working class and to establish and independent political pole around which an alternative can be organised. Stirring stuff David- but I wonder how much further on we are since I wrote this letter in 1998, published in the Independent? I WAS fascinated by Donald Macintyre’s article on the problems raised by Scottish devolution (Comment, 7 April 1998). How important is the Union? Politically, 18 years of Conservative majorities in England and Labour majorities in Scotland indicate that so long as New Labour keep Middle England sweet, Scotland is irrelevant. Economically, Scotland’s mix of export-dependent manufacturing and agricultural industries means a strong pound is hitting harder. An independent economic policy based on stronger European links therefore becomes more attractive to business. Culturally, the devolution gamble is that a Scottish Parliament will not lead to a greater sense of shared identity among “people who live in Scotland” (as Alex Salmond very carefully put it recently), but will allow a greater participation by Scotland in British government. Frankly, I doubt if devolution will work. The impulse towards Scottish independence is not based on ethnic nationalism, but on the awareness that the United Kingdom does not meet the standards required of a modern democracy. A federal UK might, but such a possibility is not being offered. Sixty-two per cent of people living in Scotland now believe that Scotland will become independent within the next 15 years. Rather than fight to hold on to the status quo, would it not be more sensible for people living in England, Wales and Northern Ireland to treat Scottish independence as an opportunity to extend their own democratic freedoms through some form of federal government? This post about the rise and fall of the Labour party in Scotland is from 2015, but I have updated it with election statistics covering 1918-2016. ” through some form of federal government”. Most of the examples available are in countries with a large land mass eg Canada, Australia. Both of those have bicameral parliaments based on the Westminster model – a dinosaur structure from the days when only certain people had the right to vote – and that was a limited right, wide open to lobbyists and back-scratching. And the head of state? It must be obvious in this today that ‘presidents’ sooner than later become less than ‘stately’. Might the Swiss, or even old Viking models, be a better way forward? Or is that shrieking pit and those insult-laden ‘debates’ the ‘best of the bunch’? It’s certainly not ‘democracy’, nor inclusive. The Yes movement want Independence for Scotland. Corbyn wants to keep Scotland locked up as a British Colony. Yes. And yet they are the same social element, the one I outlined.